I live in TN, and as a Latina it is very difficult to find the �€œpicante/hot�€ sauce anywhere. Your delivery was on time and did not take long. Best Enchilada sauce ever. So glad I found your website. Will be ordering again. I have already recommended you to my sister who lives in St. Louis, MO. I've used this sauce for years. When I moved away from California I had my family send it to me in my annual Christmas "care package" since it wasn't available where I'm now living. Now I can buy it from MexGrocer.com and I'm no longer lost without it. 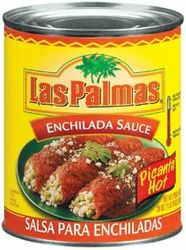 It's the best sauce for most Mexican dishes. Wonderful! This is the BEST enchilada sauce.